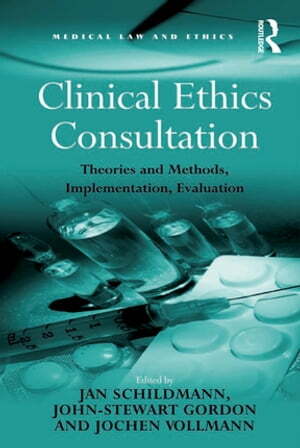 Collins Booksellers - Clinical Ethics Consultation by John-Stewart Gordon, 9781317165064. Buy this book online. This volume brings together researchers from different European countries and disciplines who are involved in Clinical Ethics Consultation (CEC). The work provides an analysis of the theories and methods underlying CEC as well a discussion of practical issues regarding the implementation and evaluation of CEC. The first section deals with different possible approaches in CEC. The authors explore the question of how we should decide complex cases in clinical ethics, that is, which ethical theory, approach or method is most suitable in order to make an informed ethical decision. It also discusses whether clinical ethicists should be ethicists by education or rather well-trained facilitators with some ethical knowledge. The second chapter of this book focuses on practical aspects of the implementation of CEC structures. The analysis of experienced clinical ethicists refers to macro and micro levels in both developed and transitional countries. Research on the evaluation of CEC is at the centre of the final chapter of this volume. In this context conceptual as well as empirical challenges with respect to a sound approach to judgements about the quality of the work of CECs are described and suggestion for further research in this area are made. In summary this volumes brings together theorists and healthcare practitioners with expertise in CEC. In this respect the volume serves as good example for a multi- and interdisciplinary approach to clinical ethics which combines philosophical reasoning and empirical research.